On the way up the stairs I was shocked to find a little white bird. I stood looking at him, expecting him to fly away. This bird was not afraid of me and wouldn’t run away. This was contradictory to every single bird I have met in my life. It all started when I decided to take the stairs instead of the elevator. I had parked in my apartment complex’s underground parking garage and was walking up the stairs to my place. 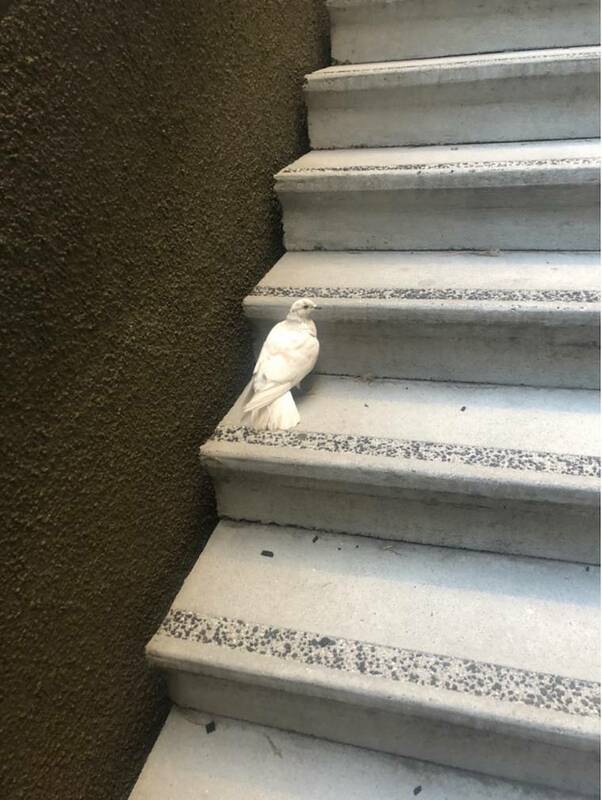 On the way up the stairs I was shocked to find a little white bird. I stood looking at him, expecting him to fly away. This bird was not afraid of me and wouldn’t run away. This was contradictory to every single bird I have met in my life. At this point, I realized something was suspicious. I went into my apartment and grabbed a towel. I scooped the little guy up in the towel (which was surprisingly easy) and brought him back inside. Now what?? I put the little guy in a cardboard box and he just sat there. After about 30 minutes of frantic googling and naming him Paul, I decided to take him to the San Jose Animal Care Center. At the shelter, the intake staff told me that this was definitely a domesticated pigeon. I dropped him off for observation for the night, with the plan to return to the animal shelter the next morning to adopt him. At this point, I was very attached to Paul and spent the entire night googling how to take care of pigeons. This was how I first came across the incredible Palomacy website. The next day when I arrived at the shelter I was unfortunately told that Paul had not survived the night. This was heart breaking, and shocking since Paul did not seem to exhibit any symptoms of distress. 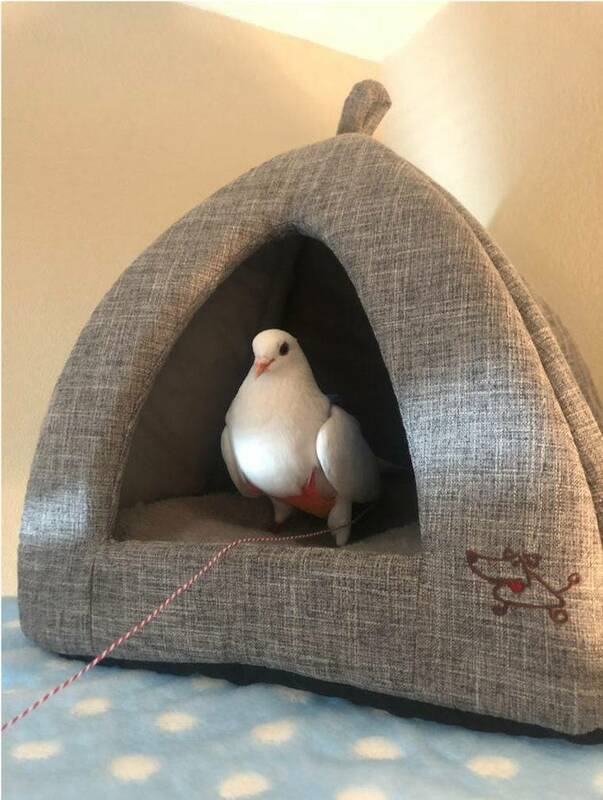 Later research revealed that often times pigeons can hide their symptoms, and his calmness and docile nature were actually weakness-induced lethargy (common in the starved and often injured domestic pigeons people find). I was sad, but took solace in the fact that Paul had spent his last night with a heating pad in a safe environment at the shelter. At this point though, I knew that I wanted to rescue a pigeon or two. I had already discovered the Palomacy website through my research, and knew that there were dozens of birds looking for a home. I emailed Elizabeth back and forth and arranged to volunteer at the next Palomacy outreach event. Elizabeth had already identified a couple of pairs of pigeons that would work well with my environment, and we had coordinated for her to bring a few of them to the event for an introduction. Before the event, I read through their bios on the Palomacy website and fell in love with Penny and Freddie. Penny was a beautiful 12 year old female pigeon that was rescued from a psych lab. Freddie was a female feral that was found in a box in SF and missing an eye and most of her toes. Despite all odds, these two had bonded with each other and were happily married. At the outreach event, I knew I had to adopt them as soon as I saw them. Penny and Freddie at their last ever outreach event as adoptable pigeons! After spending the day at the outreach event talking with Elizabeth and the other incredible Palomacy volunteers, I felt well equipped to adopt a pigeon. They taught me how to hold a pigeon, put on their pants, and answered any question I could think of. I bonded with Penny and Freddie and promised I would see them again soon. I then spent the next week assembling their cage, getting all the supplies I needed, and texting Elizabeth last minute questions. Once this was all done, we arranged for her to drop them off at my house; I couldn’t be more excited! On adoption day Elizabeth again walked me through everything and we made sure Penny and Freddie were settled. Freddie immediately took to the pigeon pants and walked around on the carpet for a very long time. She wasn’t spooked at all, and seemed very at ease. She immediately acted like she owned the place! Penny, who is more used to people, was also very calm. She chose a nice spot on top of her cage and observed her new surroundings. Penny and Freddie’s first night home! Since then, Freddie and Penny have become a much-welcome part of my daily life. They spend evenings outside of their cage, exploring my apartment with their pants on. Freddie is doing great for a pigeon who was once feral; she lets me put her pants on without any trouble and has recently started eating out of my hand! She still growls at you when you try and grab her from her cage but she’s capable of being held and petted. Right now she can handle about ten minutes of petting and neck scratches before she flies away to a high perch somewhere in the room. Letting Freddie open up and express her personality has become a “project” of mine, so it’s great to see her improvement in just a few weeks. I’m confident that with time she’ll become the ultimate lap pigeon. Penny is also doing extremely well and is completely at ease; she’ll sit with you for as long as you want, and also go off on “walks” around the apartment. Her personality is calm and docile and incredibly well-natured. At night she gets a bit more active and will coo at herself in the mirror or ring some of the bells in her cage. I honestly couldn’t be happier with Penny and Freddie and my experience with the Palomacy community. It’s unfortunate that Paul passed away, but he opened up my eyes to a whole new type of pet and helped facilitate the rescue of two more beautiful, in-need pigeons. 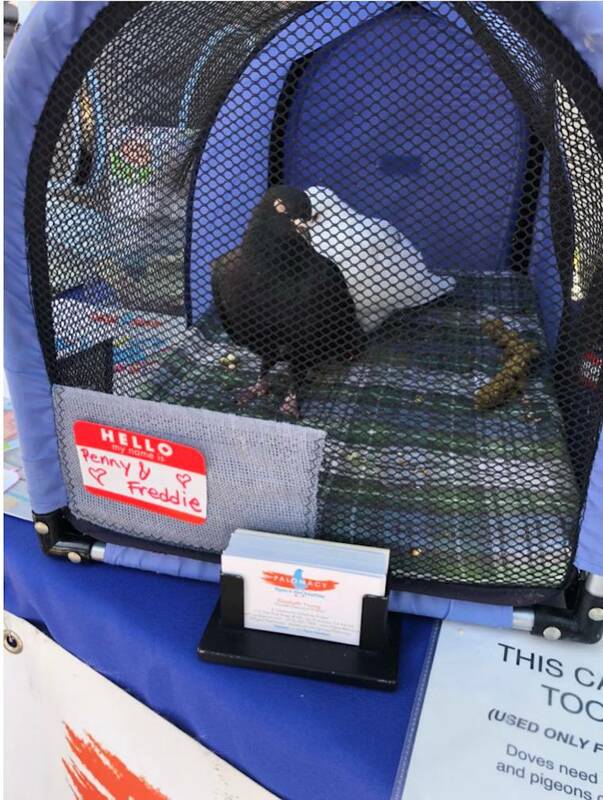 Palomacy's Note: Emma’s quick journey from knowing nothing about pigeons to finding one in trouble and becoming a devoted adopter and volunteer is a testament to how incredible pigeons are and how wonderful helping them can be. One doesn’t need prior bird experience or a big aviary, just the willingness to learn (from the pigeons mostly) and the desire to help. Freddie, a rescued but unsocialized feral pigeon has quickly gone from aloof to loving with Emma. 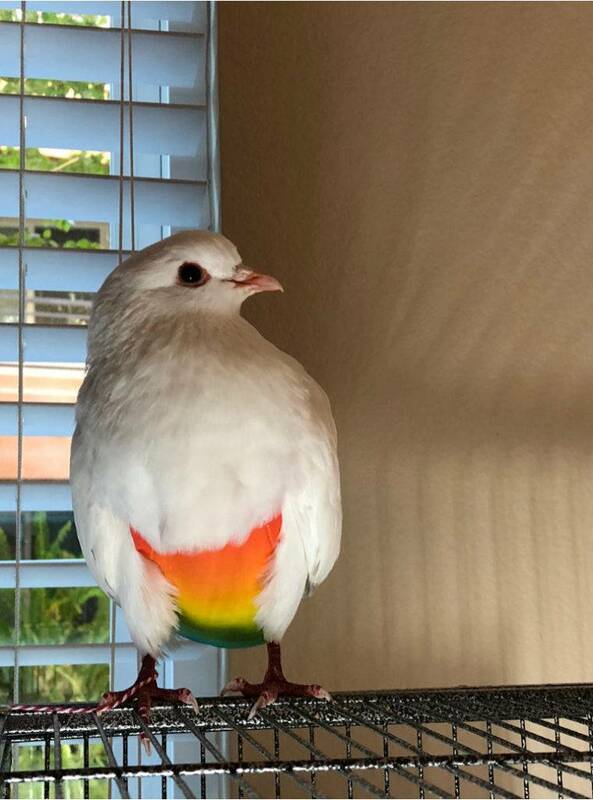 I know very well how adaptative pigeons are and still I was amazed when I saw “wild coyote” Freddie walk around Emma’s apartment (wearing pigeon pants!) that first night. She was immediately happy! Thank you, Emma, for helping Paul and for honoring him through supporting Palomacy. Thank you for opening your heart and home to Penny and Freddie!